Today's action is simple. Call your Senators and your Rep to urge them to support two newly introduced bills (one in the House, one in the Senate) that would prevent Bannon from sitting on the National Security Council. Check here to see if your Senators have already co-sponsored the bill yet. "Hi, my name is YOURNAME. I'm calling from YOURTOWN/CITY. 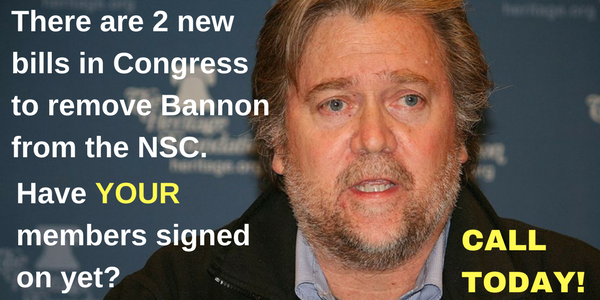 I don't need a response but wanted to thank the Senator for co-sponsoring Senator Mark Warner's bill, S.291 to modify the requirements for membership in the NSC because Bannon's presence on the NSC is unprecedented and dangerous and serves no one but him. Please thank Rep. REPNAME for leading on this issue. Thank you so much for your time." "Hi, my name is YOURNAME. I'm calling from YOURTOWN/CITY. I don't need a response but wanted to urge the Senator to please co-sponsor Senator Mark Warner's bill, S.291 to modify the requirements for membership in the NSC ASAP. It does not serves anyone except Steven Bannon for him to have a voting seat on the NSC. It's unprecedented and dangerous and the Senator needs to stop it. Can you please tell me if the Senator is co-sponsoring S. 291 or pass me on to someone who can? Thank you so much for your time." 2. Call your Representative about H.R. 804 - find his or her contact info here (and add it to your activism cheat sheet if you haven't already). Check to see if he or she has already co-sponsored this bill. "Hi, my name is YOURNAME. I'm calling from YOURTOWN/CITY. I don't need a response but wanted to thank Representative REPNAME for co-sponsoring Rep. Murphy's bill, H.R. 804 to prevent political appointees from serving on the NSC because Bannon's presence on the NSC is unprecedented and dangerous and serves no one but him. Please thank Rep. REPNAME for leading on this issue. Thank you so much for your time." "Hi, my name is YOURNAME. I'm calling from YOURTOWN/CITY. I don't need a response but wanted to urge Rep. REPNAME to please co-sponsor Rep. Murphy's bill, H.R. 804 to prevent political appointees from serving on the NSC because Bannon's presence on the NSC is unprecedented and dangerous and serves no one but him. Can you please tell me if Rep. REPNAME is co-sponsoring H.R. 804 or pass me on to someone who can? Thank you so much for your time." If you have time to go the extra mile, please tweet at them, submit a comment via their web form or post on their Facebook pages, too. And put all those addresses in your cheat sheet so you have them handy next time.